It's been a week filled with much emotion. Both highs and lows. There was huge excitement when Swirly-Tea finally arrived - and incredible sadness when our lovely Sundance (aka Sunny) left us. He died quite suddenly on Wednesday night. We were all stunned that one moment he was purring, enjoying being stroked - and shortly afterwards he was dead. 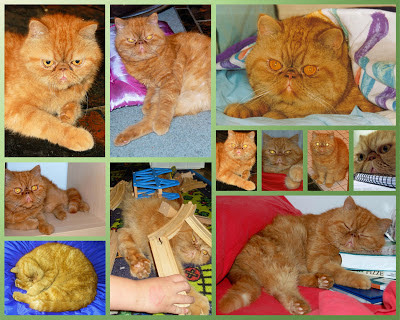 I adopted Sunny from the RSPCA in late 2001. I hadn't intended to get a cat. A good friend insisted I go to see him. She was adamant I liberate this beautiful boy, who had many positive attributes - with the added bonus that he "matched my hair"! At the time my hair was dyed vibrant red and when I went to see him, he was a pretty good colour-match. Colour co-ordination aside, I was still quite sure I didn't need a cat so walked around the room looking at all the other felines and feigning indifference to the one in the corner. Whenever I looked up though, his golden eyes were watching me. And so I got a cat - or rather a cat got me. When I was filling in all the necessary adoption paperwork, I was advised my new companion was "a timid cat" and would require particular care. My "timid cat" sat in his travel box beside me as I drove home. He purred all the way. Once home I put him in the laundry and closed the sliding door. About an hour later he opened the door and sauntered out, still purring. So much for being timid! I changed his name from "Flutta" to "Sundance" but mostly he was called "Sunny". He was about a year old when he came to live with me, around twelve and a half years ago. We've been through a lot since then. There were many different addresses and at the end of 2004, Nick and Oscar moved in. Sunny loved Nick but wasn't greatly keen on Oscar. In time though, they formed an odd-couple kind of friendship. Vaughan came along in 2005 and while both cats were very tolerant of the Young Master, it was Sunny who lay without protest to be "protected" by many pieces of train track! Sunny was already suffering some mobility issues in 2009 when he was savagely attacked by two dogs. His injuries were severe and though he did recover, the damage later led to significant arthritis which was diagnosed not long before we relocated to Victoria. 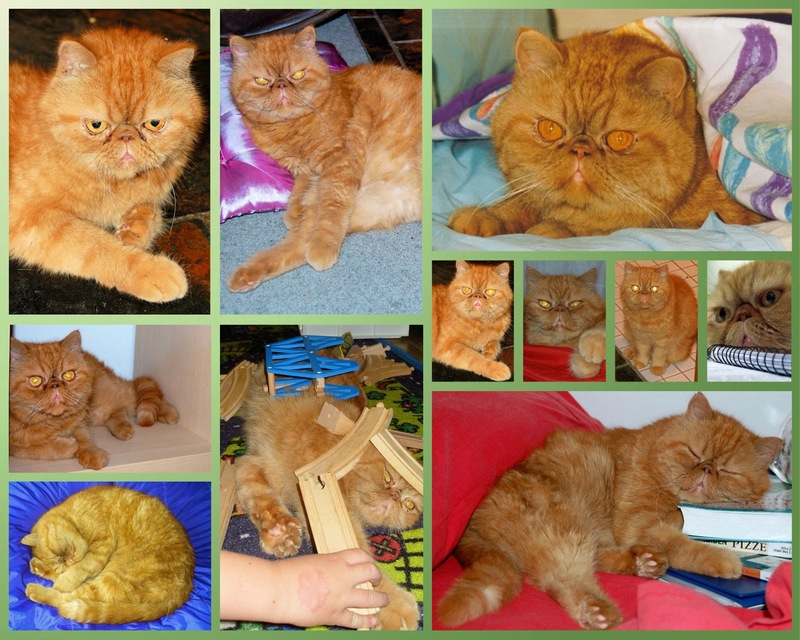 At the time of diagnosis, Sunny had very little support from his back legs and dragged himself about much of the time. So sudden was the change that we at first checked for a tick. 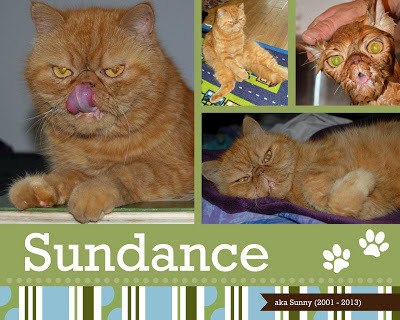 Throughout all treatment and examinations, Sunny remained purring and co-operative. He really was a beautiful cat. Since moving into our Hamby Home(in)stead, Sunny's gait had improved and he was able to walk fairly steadily (albeit diagonally) a lot of the time. He loved stretching in front of the fire and spent lots of time snuggled on our bed, often on my dressing gown. It really seemed the country life was agreeing with him - which was lovely to see. We buried Sunny yesterday. It seemed fitting that the skies were grey and it rained throughout the day. I couldn't give him my purple dressing gown, so he was wrapped in a similar piece of polar fleece. At one stage of his career, Nick was a funeral director. He ensured Sunny's box casket was lowered properly and prompted us to share some happier memories of our little cat. (Oscar watched the funeral from afar). I've found a gorgeous rose, appropriately named "Sundance" and perfectly matched to Sunny's colouring. I am going to plant one - not to remember him by, as he won't ever be forgotten - but rather to honour the beautiful soul that was his. What a beautiful post. RIP Sunny. Gone but not forgotten. So sorry to hear of your loss, we lost our beloved Tigger this week and miss her dreadfully. RIP Sunny.